Sources cite that women’s equality is still a long way off. There is a strong call-to-action to press forward and continue to progress gender parity. People around the world are mobilising for a future that is more equal, working relentlessly to claim women’s rights and realise their full potential. With this mission in view Event Producer Latika Alok concluded yet another successful event on 6 March at the Shangri-La Hotel, which was a clarion call in support of women’s equality! “At Ladies VIP Night, we are all about bringing women together to support and inspire each other’s achievements as well as to continue to create awareness and #balanceforbetter for gender equality. It is important for organisations to recognise female talent in their workforce and their contribution to society. Our event’s aim was to do this through an evening where a panel discussion, a fashion show by Lois London featuring a segment of fathers and daughters and much more, including interaction with women of substance, with proceeds going for a good cause, helped espouse the cause of women’s equality and I think we achieved this,” said Alok. The event saw proceeds going towards Give2Lanka and their project to supply permanent clean water connections to families. “We believe no woman in this day and age should have to struggle to carry water in buckets every day for their family,” said Alok. “This is a basic requirement and one that should be fulfilled world over.” The project donation, will focus on areas like Thurukkovil, Vinnayagapurum and Thambiluvil, where the majority of families are Samurdhi families to provide clean drinking water. These rural and under-served communities have high incidences of waterborne diseases and a scarcity of aid. The donation will help to establish comprehensive, safe, holistic, water solutions that include the essential tools and education to serve all community members. Many of the families in these communities are headed by women due to the impact of the war. “Just Rs. 6,200 is all it takes for a single water connection for a family (which includes the Rs. 5,600 payment to the Water Board) to have access to clean water,” said Alok. “HSBC, with 52% of its global workforce being women and a global banking brand is committed to enabling an environment where people can fulfil their potential; where different ideas, backgrounds, styles and perspectives are actively sought out to create business value. Hence HSBC was pleased to partner with Ladies VIP Night as the main partner to support and encourage women. HSBC is focusing on the diversity profile of its workforce to make it more reflective of the communities that they operate in and the customers they serve,” said HSBC Sri Lanka and Maldives CEO Mark Prothero. 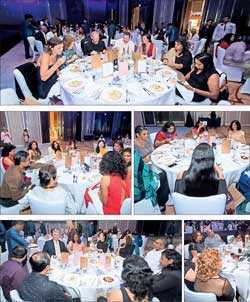 The event which was held at the Shangri-La Hotel, Colombo was the perfect venue and hospitality partner for this memorable evening. Guests enjoyed a seated five-course dinner prepared by the hotel’s renowned chefs headed by Executive Chef Patrick Buttgereit. The panel discussion – ‘Women on a Mission’, saw women from the industry who have currently been in the news and who have a mission discuss how everyone could join hands to continue to press for progress and #BalanceForBetter. They included International Retail Banking and Wealth Management – Asia Pacific Head Betty Miao, with over 20 years of experience within the HSBC Group, who has had worldwide assignments in Asia, the UK and North America, Design Corp. Founder and Chairperson Linda Speldewinde, who focused on differences her initiatives such as ‘Design and made in Sri Lanka’ will have on the community as a whole. In addition, she also discussed the benefits the Colombo Innovation Tower will bring to Sri Lanka. 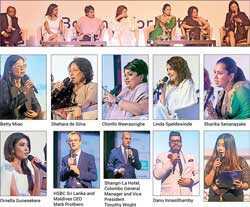 Sumi Moonesinghe who launched the No Kunu (No Garbage) initiative in May 2018 to educate all citizens to help transform the country into a cleaner and greener nation was yet another panellist; “Each day, I live, I want it to be a day to give the best of me. I want one moment in time when I am racing with destiny.” She was represented by Shehara de Silva. MAS Holdings Director Environmental Sustainability Sharika Senanayake has been working on reforestation projects that can change how we fight deforestation in Sri Lanka and, in particular, a unique ‘Seed Bomb’ pilot in conjunction with the Sri Lankan Air Force. Ornella Gunesekere who won the Miss Sri Lanka for Miss Universe 2018 crown was yet another panellist. She represented Sri Lanka at the 67th edition of Miss Universe pageant and won ‘Miss Congeniality’ out of 94 countries. Ornella works with a small school of 215 students by teaching them how to express themselves and is also using international teaching methods to expose them to a different experience thereby broadening their perspective of the world. She works to open their eyes to their own individual skills as opposed to allowing them to be stuck in the traditional way of learning. “If you want to get to the rainbow – you have got to be willing to put up with the rain.” Yet another panellist was Chinthi Weerasinghe, who has built her career as a technologist with over 20+ years of IT experience, recently took on the role as CEO for Mitra Digital a leading end-to-end technology solutions provider focused on digital transformation and cloud enablement. The panel was moderated by Nisthar Cassim, a Senior Journalist and Editor of the Daily FT newspaper. 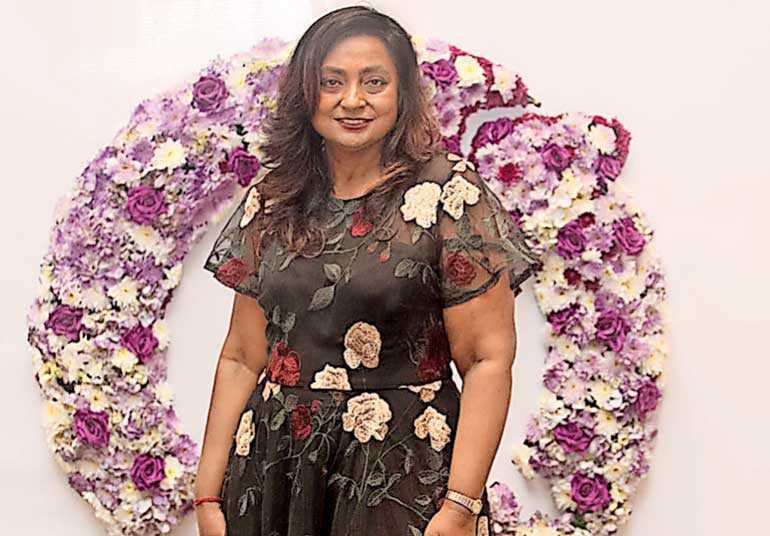 The evening included a fashion show by Radhika Perera-Hernandez of Lois London, which showcased a versatile and timeless collection with flowing silhouettes that fit any size. A special feature of the show was the segment of Fathers and Daughters on the runway, namely Chandana and Tarja de Silva, Shakir and Tazneem Lukmanjee, Tissa and Maya Aluwihare, Ashok Ferrey and Frankie, and Quintus Fernando and Natasha Ratnayake. Ramani Fernando Salons were the official Hair and Beauty Partners for the evening, while other champions of good, responsible businesses officially supporting the event were AIA as Insurance Partners, Serenia Residences as Property Partner, ANC Education as the Education Partner who are specifically introducing a special MBA program to empower women, Electronic Media partner was Lite87, Luxury TV Partner was Hi TV, Digital Media Partner was Hi Online, HI Magazine, Ticket Print Partner, IAS, while Grand Flora were the official Floral Partners who created the beautiful table décor for the evening as well as the photo backdrops. This year, guests were also able to enjoy receiving special discount vouchers from exclusive local businesses supporting International Women’s Week. “Change lies with us, within us, lets unite for ‘#BalanceforBetter’,” said Alok at the conclusion of a very successful and thought provoking evening.